Be the first to share your favorite memory, photo or story of Roger L.. This memorial page is dedicated for family, friends and future generations to celebrate the life of their loved one. 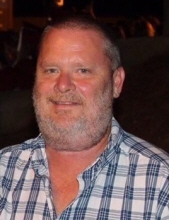 HILLSBOROUGH: Roger L. “Smokey” Bayes, 54, passed away unexpectedly on Friday, March 15, 2019 at his home in Hillsborough. He was born in Rockingham County, NC to the late WB Bayes and Barbara Bailey Bayes. He is survived by his loving wife Beverly Bayes; daughter, Megan Bayes; brother, Keave Bayes (Rachel); sister, Donna Bynum; nieces, Brittany Bayes, Carly Welty; nephews, Kevin Bayes and Wesley Bynum. He was an avid Duke basketball fan. The family will receive friends from 3 to 5 p.m. on Wednesday, March 20th at Clements Funeral Home in Hillsborough. A funeral service will be held at 5:30 p.m. on Wednesday, March 20th at Clements Funeral Chapel, Hillsborough. To send flowers or a remembrance gift to the family of Roger L. "Smokey" Bayes, please visit our Tribute Store. "Email Address" would like to share the life celebration of Roger L. "Smokey" Bayes. Click on the "link" to go to share a favorite memory or leave a condolence message for the family.